Thanks to the deal his mother made with Lucifer before his birth, David is a half breed demon stuck serving a sadistic demon master with little hope of ever breaking free of the contract. We meet David right after he is freed from a two hundred and forty-five year stint caged in sensory deprivation. His master pulls David from the punishing cage five years early and sends him out on a job before he is given a chance to adjust, his deprived senses still on overload. Once again set loose in the human realm, David learns his mark is a fifteen-year-old girl. There is a reason David’s master sends him to a nightclub in search of the girl. Should David ever give in to temptation and bed one of the beautiful women set in his path, he’ll lose the battle with his demon side and become a full demon with no hope of ever escaping his master’s cruel hand. Anything honest and good left inside him would be destroyed forever. But David’s mark is not left without protection from one such as him. She has been placed under the watchful eye of two powerful Guardians, a brother and sister, both who are willing to give up their lives to protect their young charge. Normally this wouldn’t be enough to stop one such as David, but Beka, one of the Guardians protecting his mark, is beautiful and a temptation he might not be able to resist. It doesn’t help when Beka is also attracted to him. She feels a connection with him even though her brother recognizes David’s demon side and the threat he posed to the girl they must protect at all costs. 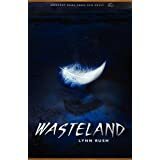 Wasteland gave me everything I could hope for when choosing a paranormal romance. Tension begins to build right from the start as we watch David fight for control of the demon inside him (literally). He must risk everything and switch sides if he wants to keep the woman he loves alive and safe, even if it risks another tortured two hundred and fifty years placed in sensory deprivation. Can he dare to hope the Guardians speak the truth when they say his mark can help him overcome his demon side? But only if he hands her over to them instead of his master. The pace is fast and fun with plenty of fight scenes for those of you who love lots of action. A worthy five star read by author Lynn Rush. Posted by Denna Holm on March 5, 2012 in Archives.